Check out this new, innovative product that allows you to install Direct Inject in minutes! Enviro-Safe Direct Inject products connect effortlessly to our Magnum D.I. inject gun. Magnum D.I. can also be used to unplug condensate lines. This product is patent pending. Magnum D.I. Inject allows you to install any Enviro-Safe Direct Inject product into your home A/C with the same tool in a matter of seconds. This tool allows you to install the Direct Inject into all systems, even if the system is empty or full of product. 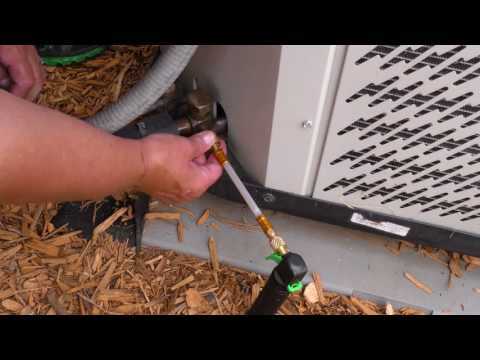 The gun can also be used to unplug blocked condensate lines. ​Magnum D.I. also allows you to install any Enviro-Safe Direct Inject product for Auto into your automobile with the same tool in a matter of seconds. DO NOT activate trigger until both ends of Direct Inject hose are connected. DO NOT use with Enviro-Safe 30 ton direct inject products. CO2 cylinders are at 3000 psi and are food grade, dry CO2. *Enviro-Safe Direct Inject products sold separately. Watch our video to see how easy Magnum D.I. is to use! 1. Unscrew cap and insert cartridge with the narrow end up. 2. Without depressing trigger, screw cartridge slowly into the cap until cartridge punctured pin. You will hear a slight air release sound. 3. Quickly and firmly screw the unit together. NOTE: Not completely screwing the unit together may result in escaping gas. 4. Depress trigger to discharge the CO2 cartridge. Enviro-Safe ProDry XL4 Inject is the very first A/C Dehydration Treatment in a direct inject product! For more information on this product, click the product title above. One of our most requested products, Enviro-Safe® ProSeal Xl4 Inject with is a small, concentrated, easy inject refrigerant leak sealant.